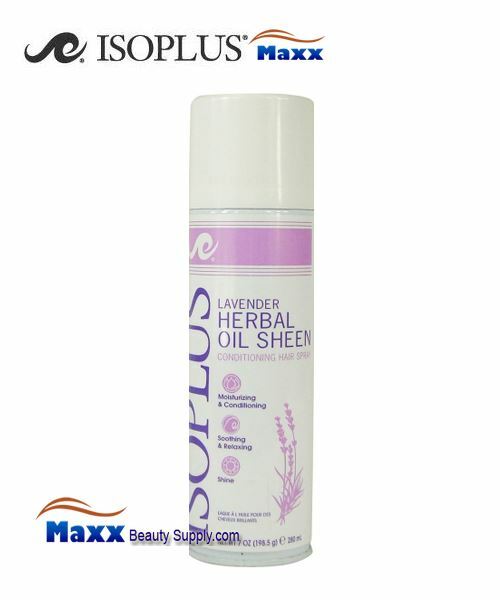 Isoplus LAVENDER Herbal Oil Sheen Hair allows hair to flow freely with natural body and motion. Leaves hair silky soft with a radiant sheen. Strengthens, moisturizes and protects hair against breakage without the use of heavy additives. For longer lasting results use ISOPLUS 24 HOUR HOLDING SPRAY. Close or cover the eyes. Hold can approximately 10 inches from the hair and spray in short bursts covering entire head evenly. For pre-thermal styling, spray lightly prior to blow drying, pressing or curling. C12-4 ISOPARAFFIN, ISOBUTANE, MINERIAL OIL, PHENYL TRIMETHICONE ISONONYL ISONONANATE, ISOPROPYL LYRISTATE, PROPANE, OLIVE FRUIT OIL, ALVOCADO OIL, FRAGRANCE, SHEABUTTER OIL, JOJOBA SEED OIL, WHEAT GERM OIL, FRAGRANCE, BUTYLATED HYDROXY TOLUENE, BENZYL ALCOHOL, BENZYL BENZOATE, CITRONELLOL, COUMARIN, D-LIMOENE, LILIAL, LINALOOL, LYRAI.